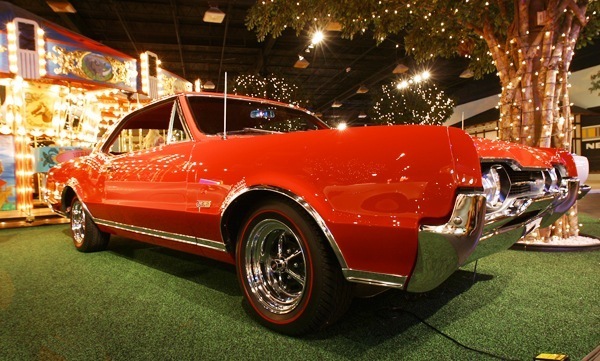 The Oldsmobile 442 (pronounced four-four-two) was a muscle car produced by the Oldsmobile division of General Motors. 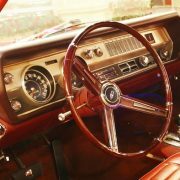 It was introduced as an option package for F-85 and Cutlass models sold in the United States beginning with the 1964 model year. 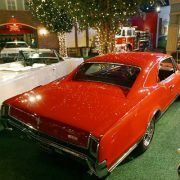 It became a model in its own right from 1968 to 1971, then reverted to an option through the mid-1970s. 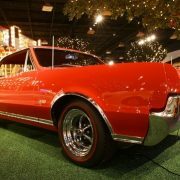 Oldsmobile revived the name in the 1980s on the rear-wheel drive Cutlass Supreme and early 1990s as an option package for the new front-wheel drive Cutlass. 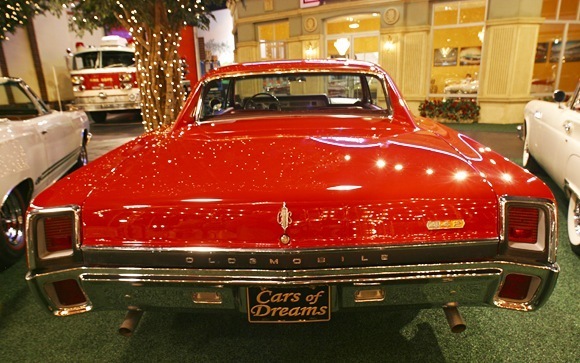 The 442 was born out of the competition between Pontiac Division and Oldsmobile. 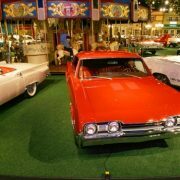 It began as a hasty response to the Pontiac Tempest GTO, which had proved to be an unexpected success midway through the 1964 model year. 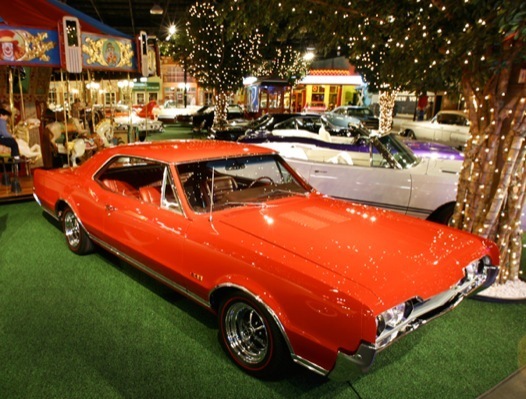 Because of its late introduction (some three-fourths of the way through the model year) and the ambiguous nature of the GTO – which was technically a violation of GM policy limiting intermediate models to 330 cubic in (5.4 L) – the Olds offering was a conservative package. 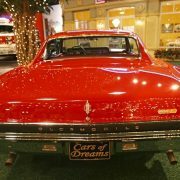 Technically the “B09 Police Apprehender” option, it used the four-barrel carbureted 330 cubic in (5.4 L) V8 with heavy-duty valve gear, posi trac, and a hotter camshaft, raising rated (SAE gross) output to 310 hp (231.3 kW) at 5200 rpm. Torque remained 355 lb – ft (481 N-m), although the torque peak rose from 2800 rpm to 3600 rpm. The package also included a stiffened frame, boxed rear suspension control arms, a heavy duty clutch and four-speed manual transmission, a heavy duty driveshaft, oversized brakes and the heavy-duty police-package suspension, with heavy duty wheels, higher-rate coil springs front and rear, heavy-duty shock absorbers, a larger front anti-roll bar, and an additional rear anti-roll bar. 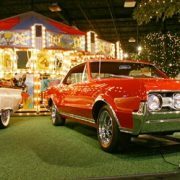 The package was dubbed 4-4-2 based on its combination of four-barrel carburetor, four-speed transmission, and dual exaust. 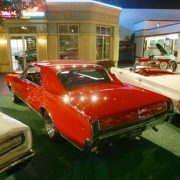 Priced at $285.14, it was available on any F-85 or Cutlass model except the station wagon, although most were Cutlass hardtop coupes (Oldsmobile archives indicate that approximately 10 four-door sedans were built with the B09 option). 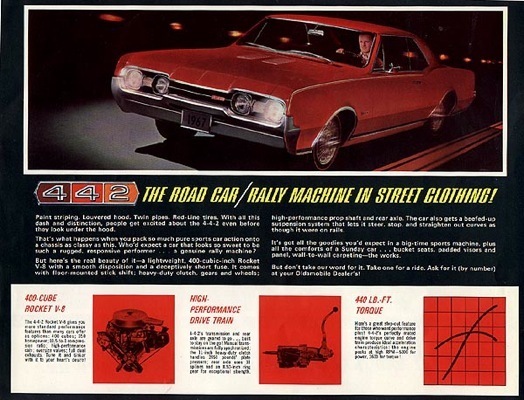 Motor Trend tested an early 4-4-2 and found that the 3,440-lb (1,560 kg) car would run 0-60 mph (0-96 km/h) in 7.5 seconds, the standing quarter mile in 15.5 seconds at 90 mph (140 km/h), and reached a top speed of 116 mph (185.6 km/h). A total of 2,999 were sold. 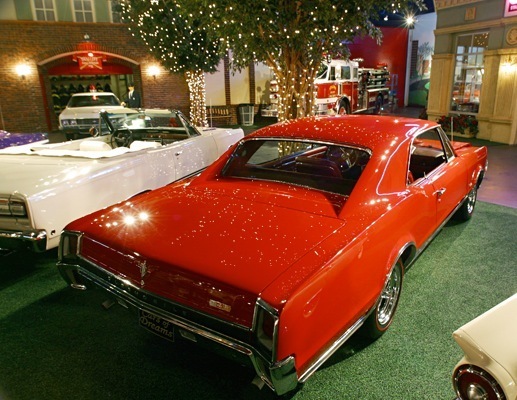 1965With the GTO receiving GM corporate sanction, Oldsmobile followed suit with a big-engine 442. The B09 option was renamed 442 and the price was lowered to $190.45 for F-85s and $156.02 for Cutlasses. 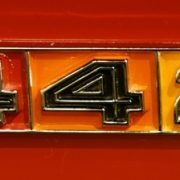 The new 400 cubic in (6.6 L) engine became standard, and the definition of “442” was restated as 400 cubic inches, 4-barrel carburetor, 2 exhausts. Output for the big engine rose to 345 hp (257 kW) and 440 lb-ft (597 N-m). 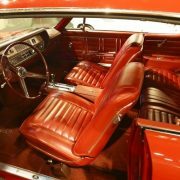 The standard transmission became a three-speed manual with the four-speed as an option, and Oldsmobile’s two-speed Jetaway automatic transmission was added as an alternative. 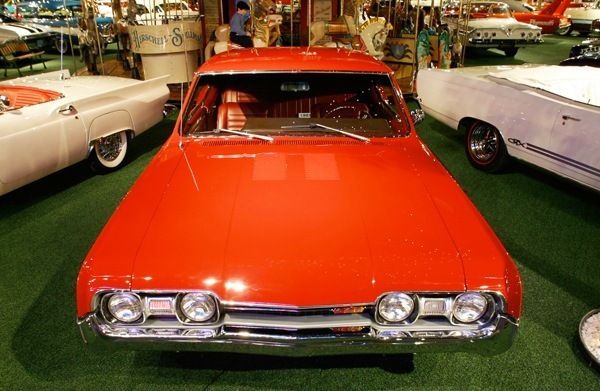 Car and Driver tested a 1966 442 with the four-speed manual and obtained a quarter mile acceleration of 15.0 seconds at 98 mph (158 km/h); 0 to 60 was listed as 5.5 seconds. 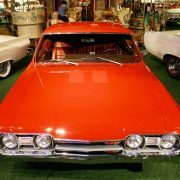 Car Life’s automatic ’65 ran the quarter mile in 15.5 seconds at 89 mph (143 km/h), with a 0 to 60 time of 7.8 seconds. Sales rose to 25,003. The 1966 442 shared a modest facelift with other Cutlasses. Its major news was the addition of two new optional engines: the L69, with three two-barrel Carter carburetors on a progressive linkage, rated at 360 hp (268 kW) and 440 lb-ft (597 N-m) of torque, and the rare W30. 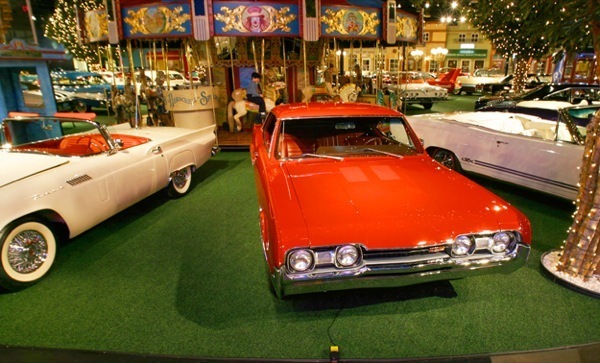 The standard engine, now dubbed L78, was rated 350 hp (261 kW)/440 ft-lbf with a single four-barrel carburetor. The W30 engine added an outside-air induction system (admitting cool air to the carburetors via tubing from the front bumper) and a hotter cam, rated — or, more likely, underrated — the same as the L69. 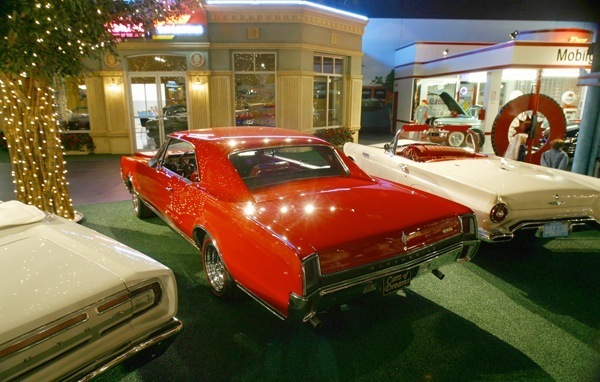 The battery was relocated to the trunk to make room for the air hoses, which prevented the package from being ordered on convertible models. 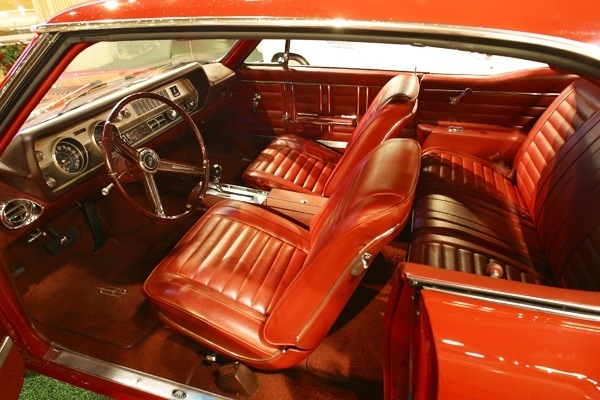 Only 54 W30s were built by the factory, although an additional 97 were produced for dealer installation. Car Life tested an L69 442 with four-speed transmission and obtained a 0-60 time of 6.3 seconds and a quarter mile of 14.8 seconds at 97 mph (156 km/h). 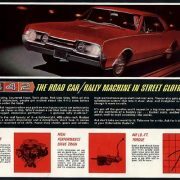 Motor Trend’s similar test car ran 0-60 in 7.2 seconds, with a quarter mile time of 15.2 seconds at 96.6 mph. Production slumped to 21,997. 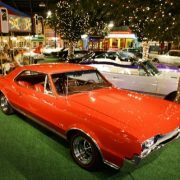 The 442 still constituted only about 10 percent of Cutlass sales, whereas Pontiac’s GTO represented nearly a third of all Tempests sold. 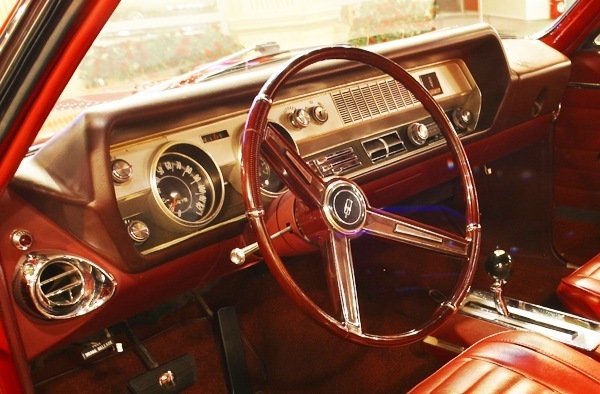 For 1967 the 442’s styling and base engine remained the same, but the optional automatic became the three-speed Turbo-Hydramatic, replacing the two-speed Jetaway. Disc brakes were newly optional for the front wheels. 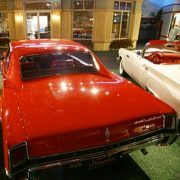 A GM policy decision banning multiple carburetors for all vehicles except the Corvette saw the demise of the L69 with its triple carburetors. The W30 remained available, although a new four-barrel Quadrijet carburetor replaced the triple two-barrels. New red plastic inner fender liners became part of the W30 package. 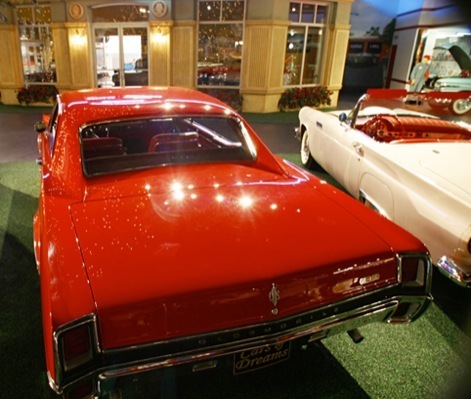 502 factory W30 engines were built to meet NHRA homologation rules, along with an unknown number of dealer-installed packages. Cars tested a W30 442 with close-ratio four-speed and 4.33 rear axle, obtaining a quarter mile reading of 14.1 seconds at 103 mph (166 km/h) in completely stock form. 0-60 times were between 6.5 and 6.7 seconds.